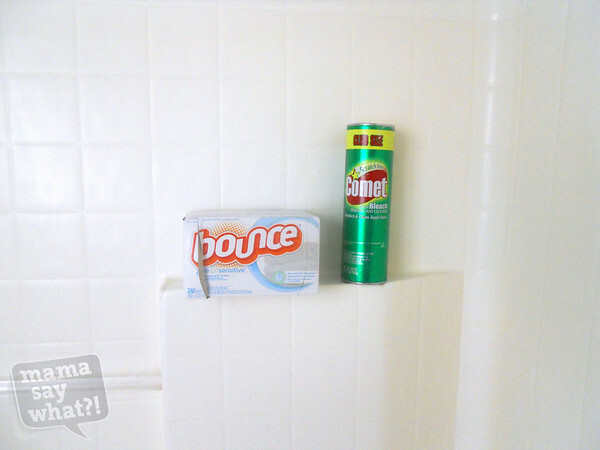 A Quick Cleaning Tip for Busy Mamas Mama Say What?! | Mama Say What?! As a new mama of two, I started realizing pretty early on that I had even less time available to do things than I did with only one little man (was that even possible?!). I decided that I would need to start multi-tasking and becoming a bit more efficient with things. One of the best tips I have is trying to combine tasks that give you a little more “me-time,” if you will. My favorite one, as of late, has been hopping into the shower to clean it! While in the shower, you can spend a little extra time scrubbing, while enjoying some blissful time to yourself without anyone (including yourself) blaming you. You are scrubbing right?! I have also learned that a dryer sheet works wonders to remove all the soap scum that might be building up. Comet is generally my cleaner of choice, so while I am showering I will sprinkle some all around the tub/shower and use the dryer sheet to scrub it clean. Of course this would work with any cleaning solution of your choice. Get a chore done, enjoy some extra time to yourself and feel accomplished as you hop out of your sparkling shower. Added by Corey P. on January 25, 2013.
interesting! I have never heard that about dryer sheets…. I have cleaned my shower while showering though. Thanks for the new tip!